This, of course, is an example of the legendary Ferrari 250 GTO – the most sought-after car in the world, or at least according to its price. Bonhams set a record during the Pebble Beach weekend in 2014 selling another ’62 GTO for just over $38 million. So why feature another one of these grand touring cars? Well, because this one wears a different body. 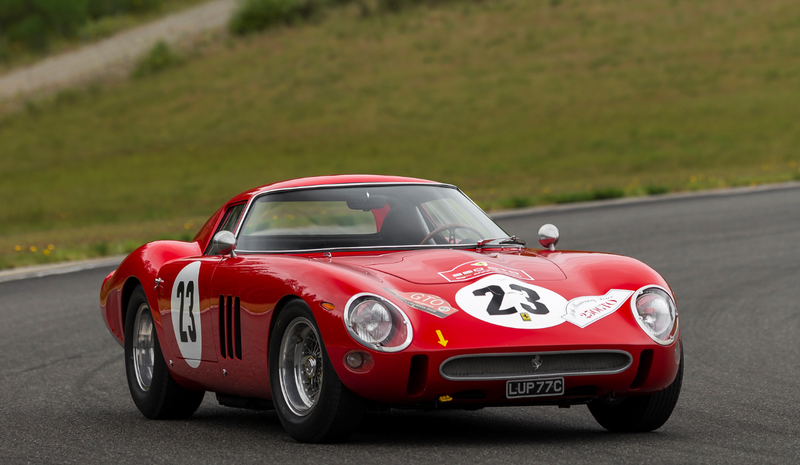 The 250 GTO – or Gran Turismo Omologata – were homologated race cars built by Ferrari between 1962 and 1964. Only 36 were made and they’re powered by a 3.0-liter Colombo V-12 rated at 296 horsepower. This one has blue seats, which look pretty cool. Most of the GTOs looked like this, including this car when new. For 1964, the final run of three cars were bodied with “Series II” coachwork. Four earlier, Series I cars, including this one, were rebodied in the more streamlined design. In fact, this was just the third 250 GTO constructed so it lived a solid two years with its first body before heading back to Scaglietti to match the 1964 cars. It is one of two with an extended roof like the 250 LM. Acquired by Greg Whitten (of Microsoft fame) in 2000, this 250 GTO is being offered for public sale. Obviously, no estimate is given, and RM Sotheby’s is requiring you to be vetted to even bid on this car. I guess you can’t have some schmo bidding $40 million on something when their net worth tops out in the seven-digit range. Anyway, it’ll sure be interesting to see what it brings – if it sells. Click here for more info and here for more from this sale. RM Sotheby’s really packed their Monterey catalog this year, so much so in fact that I thought they were finished adding cars to it so I mapped out which cars to feature over the three weeks prior to the Pebble Beach Weekend. And then they added these three rare Ferraris. Time is tight, so they are being combined into one post. Enjoy the Ferrari overflow! The 342 America was the second car in the Ferrari America line, produced in 1952 only. It’s powered by a 4.1-liter V-12 making 200 horsepower. This particular car is the only 342 America bodied by Vignale and it totally has that early-1950s Ferrari appeal. The amazing thing about the 342 America is that Ferrari only built six examples (with this being the first). Six! That’s it. It’s one of the rarest road-going Ferraris ever made. Only three of them were drop tops and this car was delivered new to Switzerland. The current owners acquired it in 2007 and had it restored to the spec you see here. The estimate on this car is $2,250,000-$3,000,000. Click here for more info. The car in this photograph definitely has the look of a child’s car. But it is not, as it is a true Ferrari race car. It started life as a 500 Mondial, the third car in Ferrari’s Monza line of sports racers. Bodied by Pinin Farina, it doesn’t quite resemble other 500 Mondial Spiders by the same coachbuilder. Before it left the factory, Ferrari installed an engine from the slightly-earlier 735 S race car. That means this 500 Mondial is powered by a 2.9-liter straight-four that puts out 225 horsepower. That’s actually quite an upgrade over the Mondial’s comparatively weak 170 horsepower, 2.0-liter unit. To this day, no one knows why Ferrari built this car this way. Sold new to a man in California, it spent its early days tearing around tracks on the West Coast in regional sports car races. The current owner has had the car since 1999, meaning it is being offered from relatively long-term ownership. 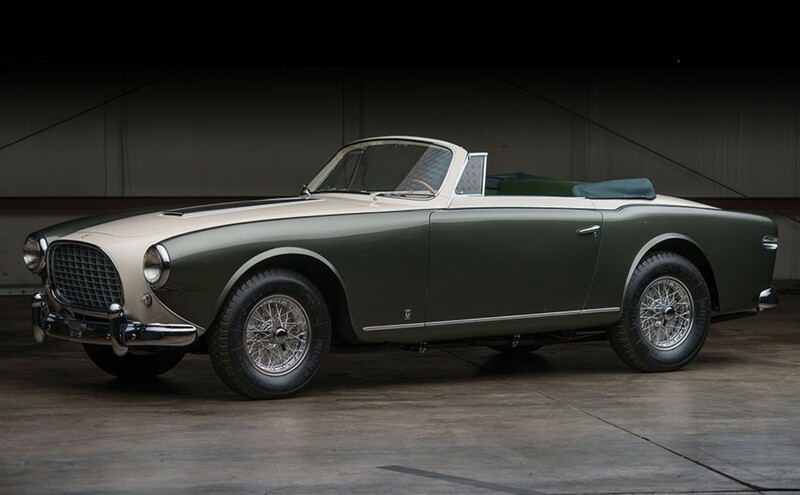 It’s one of only 13 Pinin Farina Spider-bodied 500 Mondials. And possibly the only one with a 735 S engine. It should bring between $4,000,000-$5,500,000. Click here for more info. This is one of the more obscure Ferraris. But because it’s a sports racer from the 1950s, that means it’s worth a huge amount of money. Ferrari’s chief competition during the 1955 World Sportscar Championship were cars like the Jaguar D-Type. So Ferrari went head-to-head, developing a monster six-cylinder engine to take down the English. After that, Ferrari sold it and it entered service as a privateer car in California road races. Unfortunately, driver Ernie McAfee was killed while racing this car in Northern California. The then-owner rebuilt it and the present owner acquired it in 1997. This is a rare chance to acquire a factory Ferrari Le Mans racer. One of just four 121 LMs built, it should bring between $6,500,000-$7,500,000. Click here for more info and here for more from this sale. California Spyders are among the most special Ferraris. They have a legend all their own and a beauty almost unmatched by their contemporaries and other Ferraris alike. But there were a select few of these cars that were given to people crazy enough to take them racing. It’s like putting a supermodel in a boxing ring. The difference though, is that this is one competent supermodel. The long wheelbase California Spyder came before the short wheelbase version and were built in 1959. Only 50 were made. This car is powered by a 275 horsepower 3.0-liter V-12 engine – the Competizione spec being good for more ponies over the standard road car. The other thing that a competition Spyder had was a lightweight aluminium body. Only nine of these were ever constructed. It also had quite the SCCA run in 1960. The car has had several owners since departing Reed’s care and was restored in the 1980s and again in 2011. It’s as good as they come and should bring between $18,000,000-$20,000,000. Click here for more info and here for more from this sale. 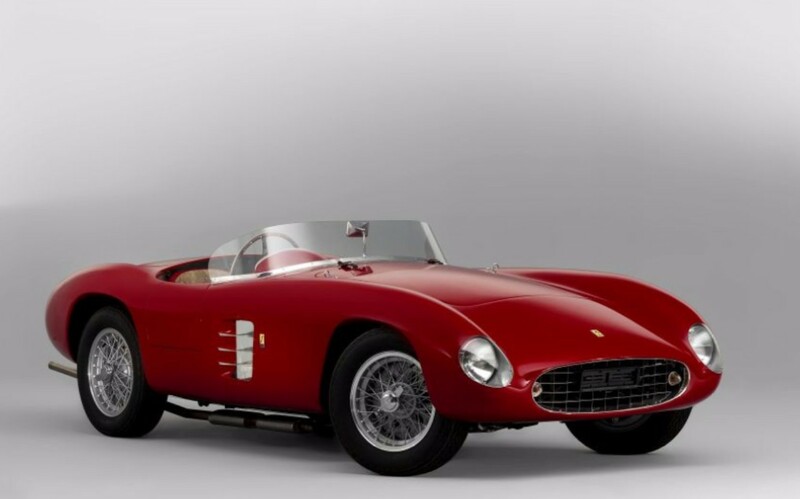 The Ferrari 335 Sport was an evolution of the earlier 315 S that was built in 1957. The 1957-1958 335 S was powered by a 4.0-liter V-12 making a handy 390 horsepower. It was a car built to dominate the Mille Miglia – and it ended up ending the race. Those last two races were in privateer hands, once the car had been sold by Ferrari to Luigi Chinetti. It was restored in 1981 and the original nose configuration was put back on the car (although the pontoon-nose was kept as well). This car has been with the same owner since 1970 and a 335 S is not a car you will likely see at auction for years to come. Click here for more info and here for more from this sale. Those are three impressive results with some of the ’50s top drivers. The 290 MM is powered by a 320 horsepower 3.5-liter V-12 that was based on the engine from Ferrari’s Formula One cars. This was a Scuderia Ferrari race car that finished 4th in the Mille Miglia with Juan Manuel Fangio – that alone is remarkable. That the car has never been crashed and is mostly unrestored (except for the repaint) is incredible. The team used the car in both the 1956 and 1957 World Sportscar Championship and in early 1957 the car was sold to someone in the U.S. It’s had a few owners worldwide since. This car can be used and hopefully whatever well-heeled buyer walks away with it next month will use it at historic races. Only four 290 MMs were built. This one will bring millions. Click here for more info and here for more from this sale. 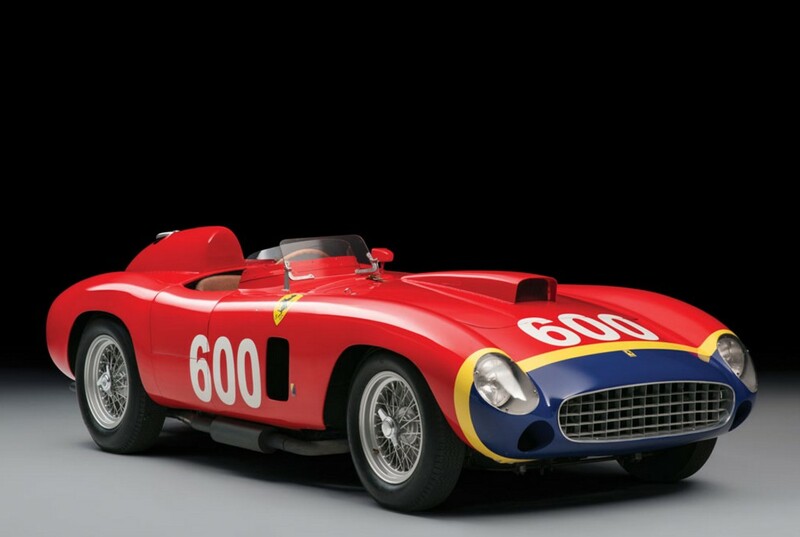 Ferrari race cars from the 1950s – the sports racers, not the Formula cars – are just so sought after. After all these years, they remain some of the most authentic, primal, and fun to drive historic race cars. Their values have skyrocketed and to find one that begs to be raced and not pampered is a rare treat. The 500 Mondial was the Scuderia’s racer for 1954. It used a 2.0-liter Lampedri straight-four making 170 horsepower (can we all stop and take a second to appreciate how awesome that output is for 1955!). The car was also light-as-air, as far as cars are concerned. This car was sold new to a Frenchman and was painted in beautiful French Blu – the original paint is still on the car. It is a “Series II” car, hence its late, 1955 production year. The first Mondials were Scaglietti coupes, later cars were open cars from Pinin Farina and Scaglietti. The original owner of this car took it racing and blew the engine. 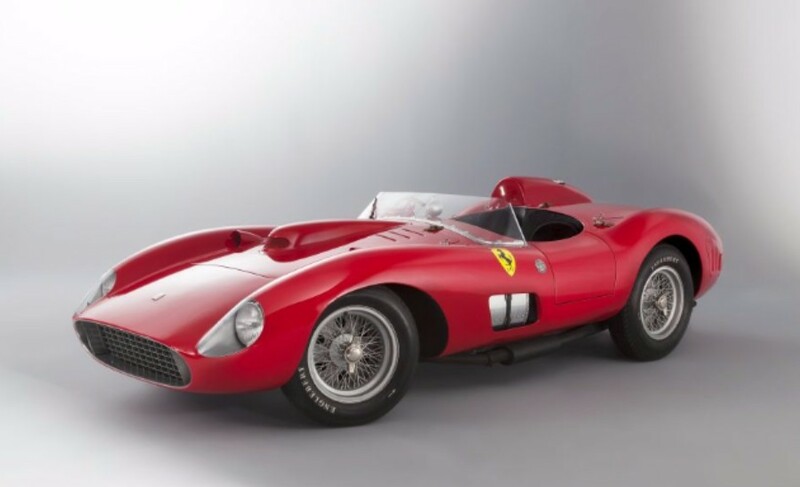 In 1955, after having it worked on at Ferrari, the owner didn’t pay his bill, so Ferrari kept the car for the next two decades, painting it red and displaying it in a museum. They sold it again in 1975 and it had a series of owners up until 2007, when its new Polish owner had the red paint removed to reveal the beautiful blue underneath. This is a factory-original car – never wrecked and ready to go. It’s a preservation class shoo-in. Click here for more info and here for more from this sale. This Ferrari 275 should not be confused with the gorgeous GT car of the same numerals built in the mid-to-late 1960s. 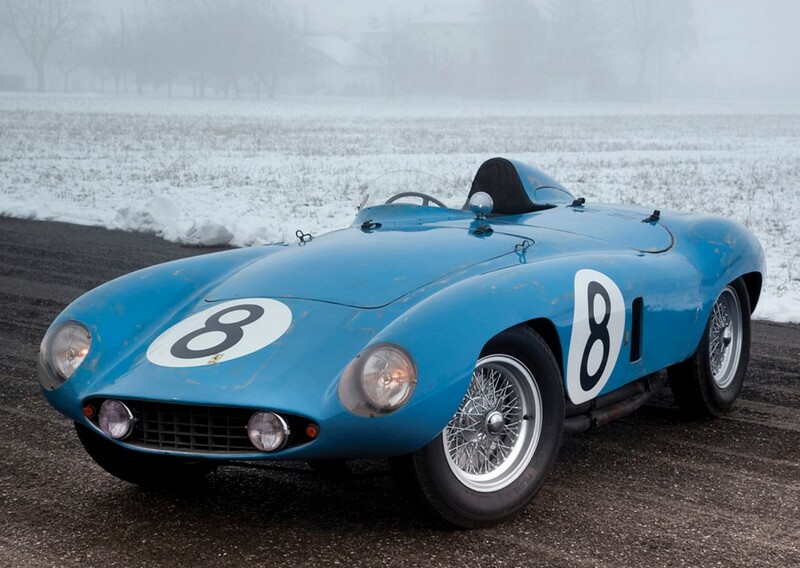 The 275S was actually the first Lampedri-engined Ferrari ever built. 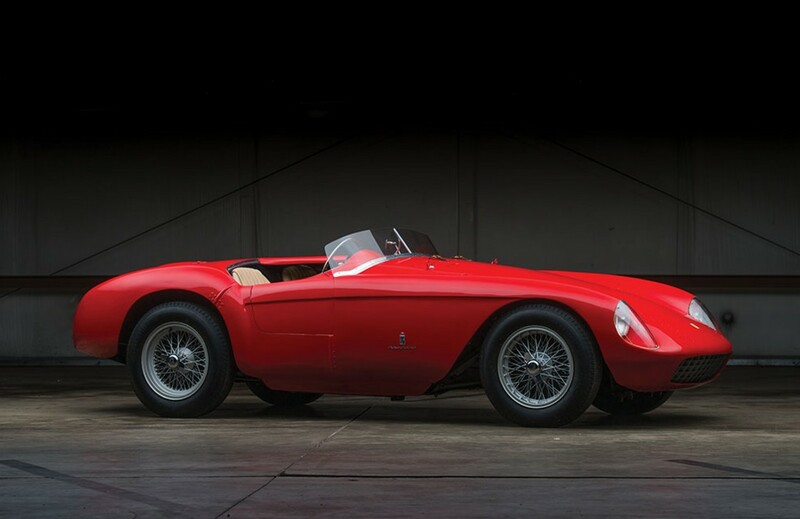 Two were built in 1950 and they were based on the 166MM but used a new, experimental 3.3-liter V-12 from Ferrari’s new technical director, Aurelio Lampedri. It had a body by Touring and was entered by the factory in the 1950 Mille Miglia, driven by none other than Alberto Ascari. It DNF’d, but still. After this failure, this 275S went back to the factory and was fitted with a new 4.1-liter V-12 from Ferrari’s new touring car, the 340 America. The engine makes 220 horsepower. It was then sold. Once it’s racing career was finished, the Touring body was replaced by this Scaglietti Barchetta. It was exported to the U.S. in 1958. It ended up being rescued from a barn in Vermont by an enterprising 15-year-old who then owned the car for over 40 years, restoring it himself and selling it in 1999. After competing in quite a few historic events all over Europe, the current owner was able to acquire the car. 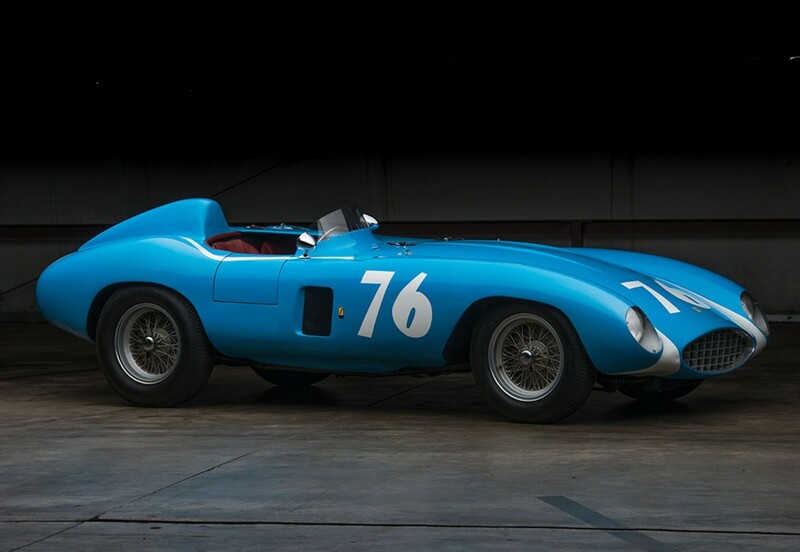 This is one of only two Ferrari 257S racers ever built. 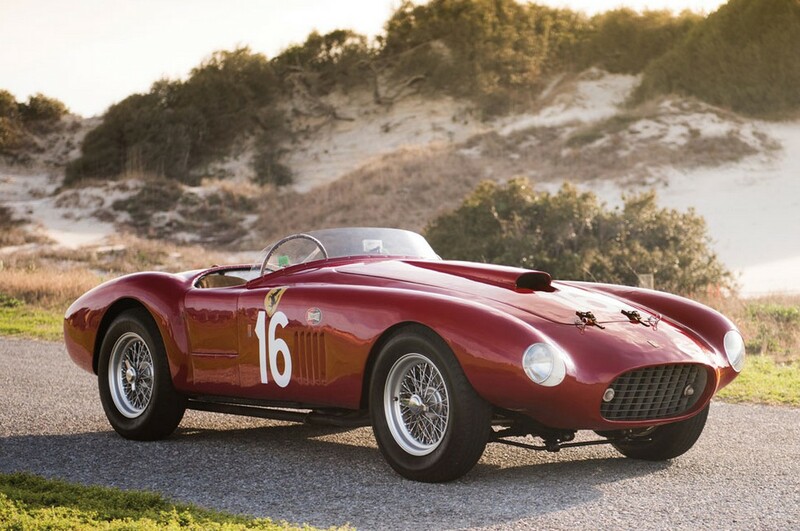 It is one of only nine Scuderia Ferrari racing roadsters from the 1950s. And it was the first Lampedri-engined Ferrari to hit the track. It’s a piece of history – and one you can use. Click here for more info and here for more from this sale. 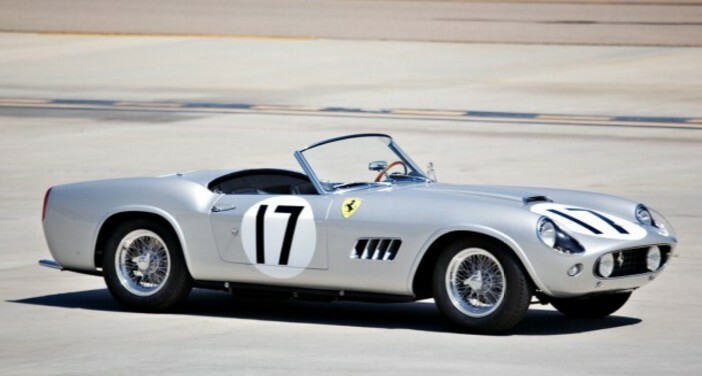 Ferrari 250s are very nice. They’re exceptional, wonderful examples of the golden age of Ferrari from the golden age of motor racing. The 250 GT Berlinetta followed the Europa GT, GT Boano, GT Ellena. They used Scaglietti bodies based on a Pinin Farina design and were sold from 1956 through 1959. These two-door coupes (only body style) were powered by a 225 horsepower 3.0-liter V-12. 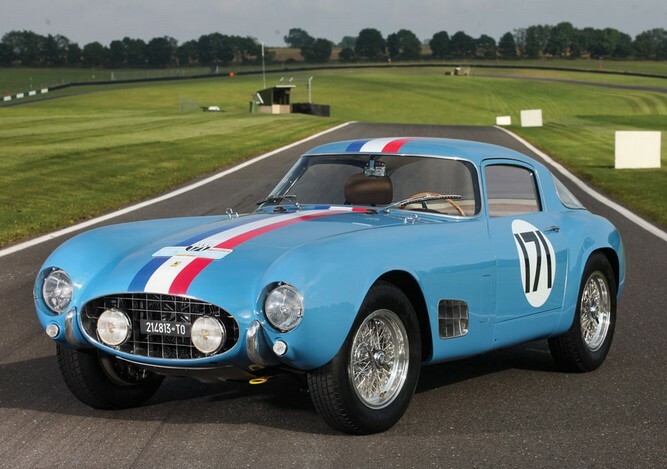 They were nicknamed “Tour de France” after the 250 GT Berlinetta won it’s first race at the 1956 Tour de France (a 10 day race in France). The GT Berlinetta also won the Targa Florio and it’s class at Le Mans. This car is finished in the best color combination you can get on a 250 GT Berlinetta. These are spectacular cars, and very important in the history of the 250 GT. This one has great period race history and known ownership from new. It’s ready to take on any historic event you want, but it’ll cost you somewhere in the neighborhood of $6,850,000-$8,650,000 in order to do so. Click here for more info and here for more from RM in London. 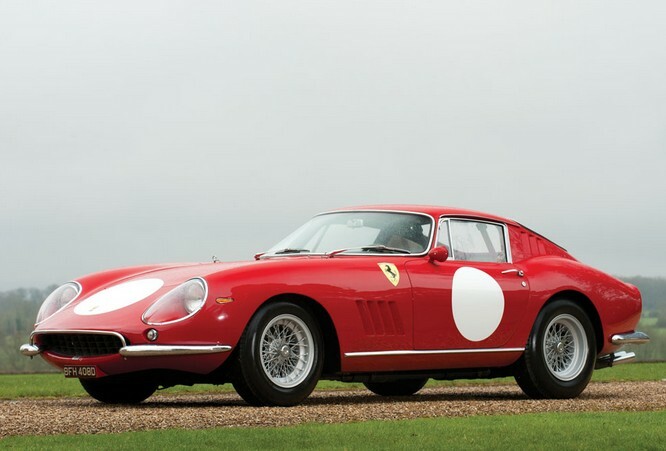 The Ferrari 275 line has skyrocketed in value over the past 10-15 years. They’ve gone from sub-million dollar cars to cars pushing the $10 million mark. RM sold an example last year for $25 million. The 275 was new for 1964 and the limited-edition GTB/C was a 1966-only model. 1965 was Ferrari’s first racing season with the 275, the replacement for the long-successful 250 series. The 275 GT Berlinetta Competizione was Ferrari’s way of building off of 1965’s success. This lightweight model used a 275 horsepower 3.3-liter V-12. Ferrari homologated the model for road/competition use. Only 12 were built. This racing special was used as a road car for three years before its third owner campaigned it in some hill climbs. What’s great about this wonderfully preserved racing car is that it was never seriously flogged on track. It’s only one of 12 – and it should sell for between $5,900,000-$6,850,000. Click here for more info and here for more from RM’s Monaco sale.